Let them mix up lunchtime too. 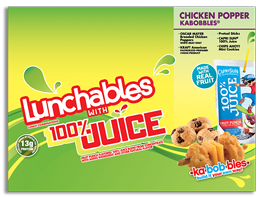 Lunchables Kabobbles with 100% Juice lets them mix up their favorite foods. More of lunchtime's greatest hits. 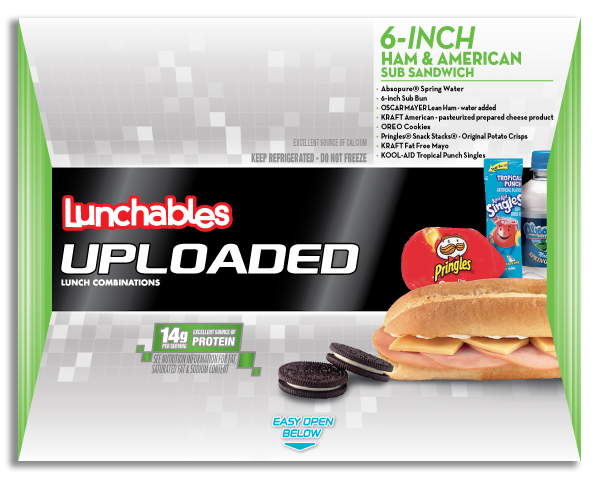 Lunchables Uploaded is packed with more of what your kids love. 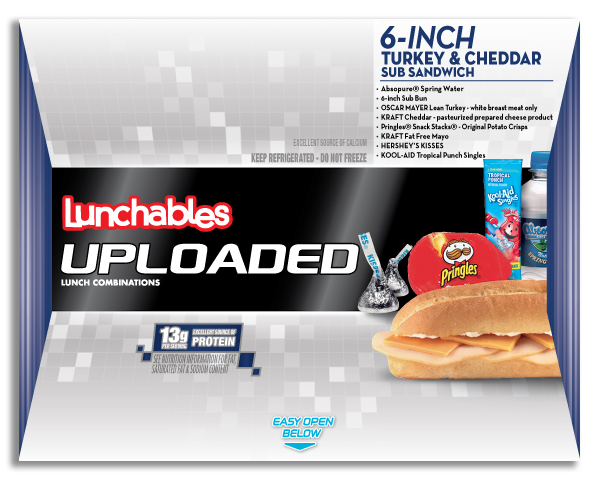 Lunchables Uploaded is packed with their favorites, like 6-inch subs, deep dish pizza, plus lots of extras like Pringles® Snack Stacks® potato crisps, FRUIT BY THE FOOT®, Absopure® spring water and Kool-Aid singles. More choices for lunchtime, with more of the stuff they love. 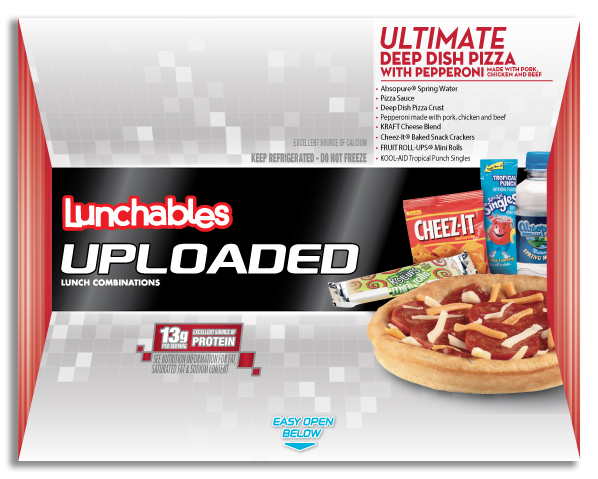 We mean it when we say it’s the ultimate. They’ll savor every bite of this deep dish crust topped with Kraft Cheese Blend, pizza sauce and pepperoni made with pork, chicken and beef. 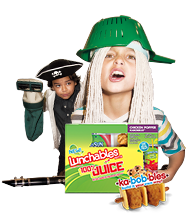 Also includes Absopure® spring water, Kool-Aid Tropical Punch single and FRUIT ROLL-UPS® snack. We mean it when we say it’s the ultimate. Give them more of the tasty classic. Your kids will love dunking these all white-meat chicken nuggets into tangy BBQ sauce. 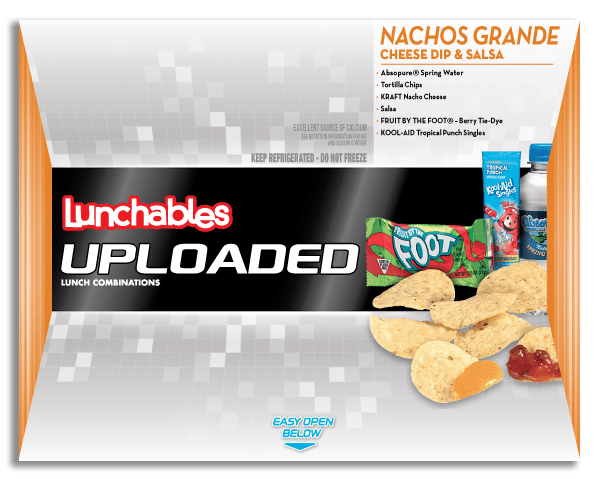 Plus, it’s packed with Pringles® Snack Stacks® potato crisps, Absopure® spring water, Kool-Aid Tropical Punch single and milk chocolate HERSHEY’S Kisses. Give them more of the tasty classic. 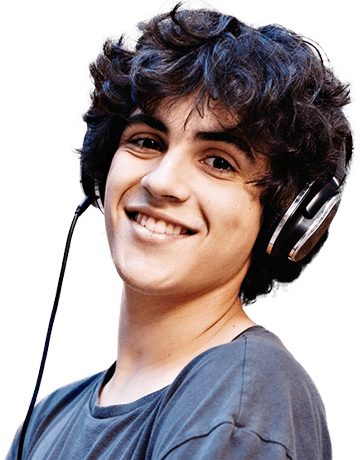 A bigger and better update on the classic duo. 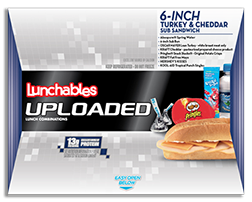 We combine lean ham, Kraft American, a 6-inch sub bun* made with 8 grams of whole grain and Kraft fat-free mayo. Your kids take care of the rest. 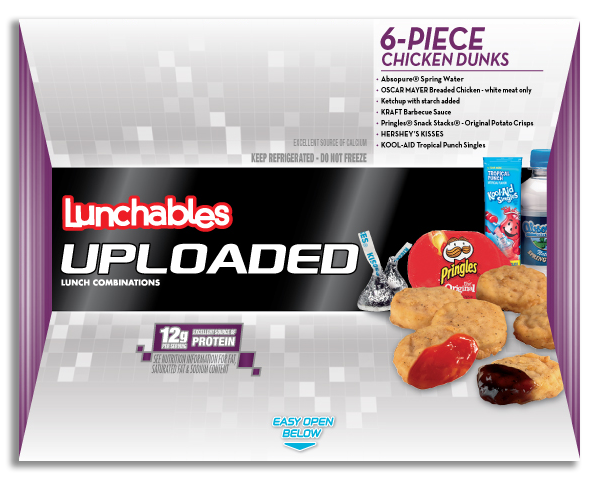 Plus, it’s packed with Pringles® Snack Stacks® potato crisps, Absopure® spring water, Kool-Aid Tropical Punch single and milk chocolate HERSHEY’S Kisses. A bigger and better update on the classic duo. Nachos like they’ve never had ‘em before. They’ll have fun dipping this extra tasty portion of crunchy tortilla chips in delicious Kraft salsa and nacho cheese. Plus, it comes with Absopure® spring water, Kool-Aid Tropical Punch single and FRUIT BY THE FOOT®. Lunchtime has never seen it so good. Start with a 6-inch sub bun* with 8 grams of whole grain, then load it with a robust helping of the good stuff — lean turkey and Kraft Cheddar. Can it get any better? Add Kraft Fat-Free Mayo. 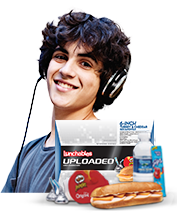 Plus Pringles® Snack Stacks® potato crisps, Absopure® spring water, Kool-Aid Tropical Punch single and milk chocolate HERSHEY’S Kisses. Lunchtime has never seen it so good. 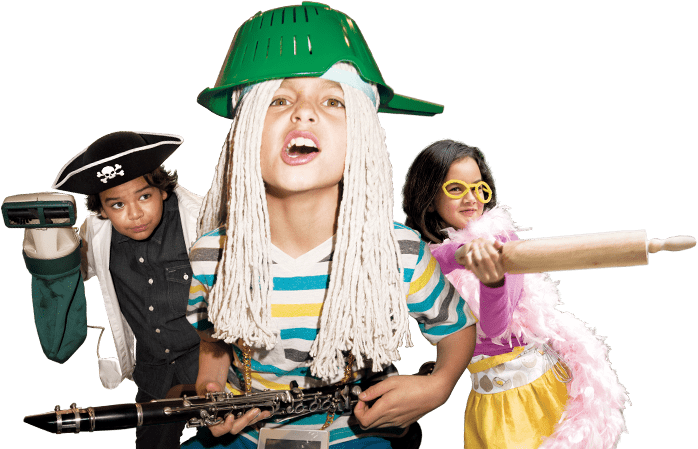 All the good stuff — and so much more. 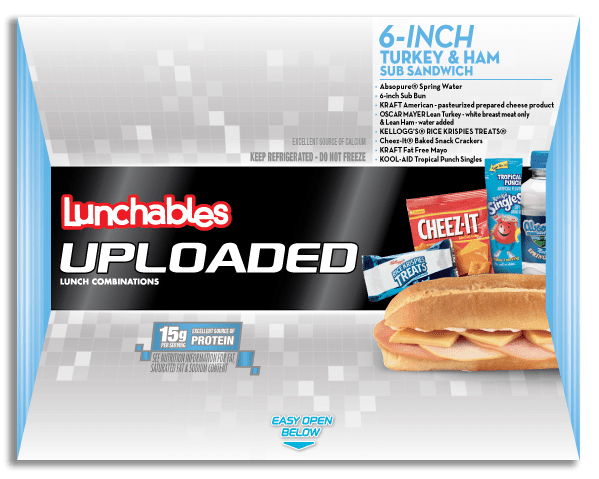 Start with lean turkey, lean ham, Kraft American and a 6-inch sub bun* made with 8 grams of whole grain. Add Kraft fat-free mayo for the finishing tasty touch. Also includes Absopure® spring water, Kool-Aid Tropical Punch single, Cheez-It® crackers, and KELLOGG’S® RICE KRISPIES TREATS® snack. All the good stuff — and so much more.